Those lucky enough to live in Rochester, New York have been using their "I Voted" stickers for so much more than just decoration. Women have been honoring Susan B. Anthony by putting their stickers on her grave as a big thank-you to one of the women who made it possible for them to make their voices heard. And if you don't live within easy driving distance of Rochester, this is definitely going to make you want to do something meaningful with your sticker. It's easy to forget that women being able to vote wasn't always a thing. It's easy not to think about the women who were arrested for trying to vote, or who went on hunger strike and ended up being force-fed. The country may not have seen its first female president yet, but women can work outside the home, vote, and hold office. The Millennial generation has grown up in an era where the first female Secretary of State led to two more in quick succession, and the numbers of women in Congress are growing, if slowly. If anything, though, this is even more reason to look back to the women who started it all, and pay tribute in some way. While at first glance it might seem disrespectful to pay homage by sticking something to a gravestone, the women doing it see it as a much more fitting gift than just flowers or ribbons or something. It's like the stickers are somehow coming back home — but that doesn't mean that you have to let yours go to waste, especially if you're now feeling inspired to make it mean something more. 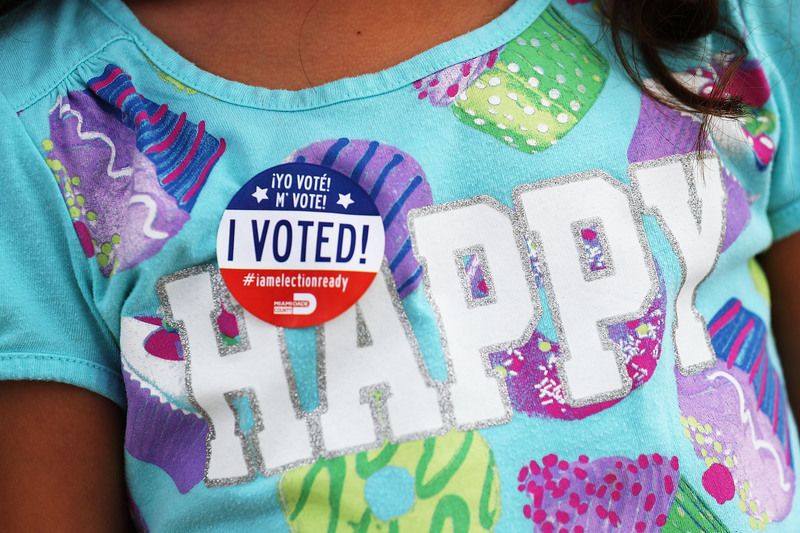 Susan B. Anthony would probably appreciate it if you passed a sticker or two on to a child in your life, in an effort to make him or her grow up to be an democratically engaged citizen. Speaking from personal experience, I always loved the day when my parents had those little red, white, and blue stickers for me to wave around proudly. Do you have a statue of or memorial to a local civil rights hero in our town? Your sticker could go to honoring their memories as well — Susan B. Anthony wasn't the only person who fought so that we could have everything that we have now. It may seem like such a little thing, but there are many reasons why those stickers have become such an iconic part of American elections. This year, now the the country finally has its first chance to elect a female president, it couldn't be more fitting that some of those still symbols of voting rights are going back to the woman who fought so hard for them.